90 Pts-WA - Condensed and richly scented of ripe pears, almonds, and peaches with fresh and clove-like finish. This wine has a nose of ripe, green citrus fruit and Christmas spices. 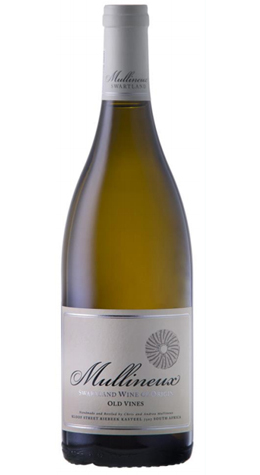 The palate is fairly full and richly textured with notes of ripe pears, almonds, and peaches. The finish is fresh and clove-like. Best served at 10 to 12 °C, this wine will show optimally when decanted in the first 3 years after bottling. Grapes for our 2015 white blend come from five sustainably farmed vineyard parcels in different parts of the Swartland: One parcel of 35 year-old Chenin Blanc planted in the stony Shale and Schist based soils of the Kasteelberg; two parcels of 40-70 year-old dry land, bush vine Chenin, one parcel of 80 year old Clairette Blanche and a 55 year old Heritage Semillon Gris vineyard grown in the decomposed Granite of the Paardeberg; and a parcel of 16 year-old Viognier planted on the rolling, iron-rich soils west of Malmesbury. Mullineux Family Wines was established in 2007 and was owned and managed by Chris and Andrea Mullineux, with business partners, Keith Prothero and Peter Dart. Within a very short time period, the winery established itself as one of South Africa’s most celebrated wine brands, both locally and on the international front. By 2014 they had received twelve 5 star ratings from Platter’s South African Wine Guide, as well as being awarded Red Wine of the Year in 2013 with their 2010 Syrah and Winery of the Year in 2014.